Ritter was born and raised in Moscow, Idaho, a college town in the north central part of the state. As a teenager, after hearing Johnny Cash and Bob Dylan’s “Girl from the North Country” on his parents’ copy of Nashville Skyline, he attempted to write songs on a lute that his father had built, before abandoning the lute and buying his first guitar at K-Mart. Ritter graduated from Moscow High School in 1995 and attended Oberlin College in Ohio to study neuroscience, but later changed his major to the self-created “American History Through Narrative Folk Music”. 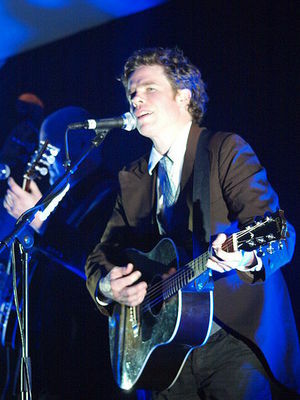 At the age of 21 Josh recorded his first album Josh Ritter at a recording studio on campus. After graduating, Josh moved to Scotland to attend the School of Scottish Folk Studies for six months. Josh then moved back to Idaho for a few months, before moving to Providence, Rhode Island, then Somerville, Massachusetts, where he worked temporary jobs and played at open mic nights. During this time, Ritter sold copies of his album and was spotted by Glen Hansard and his band The Frames, who invited him to return with them to Ireland. As an early sign of his success to come, Ritter found on the trip to Ireland that his album sold particularly well at open mics there. With the money from merchandise sales, Ritter was eventually able to quit his day job and devote himself to music full-time.